Home / Project Management / PMP / What is Critical Path Method and How to Calculate Critical Path? Critical Path Method, which is abbreviated as CPM, is one of the most popular schedule network analysis technique, as defined in the online PMP courses. Critical Path Method relies on determining the longest path in the network diagram. 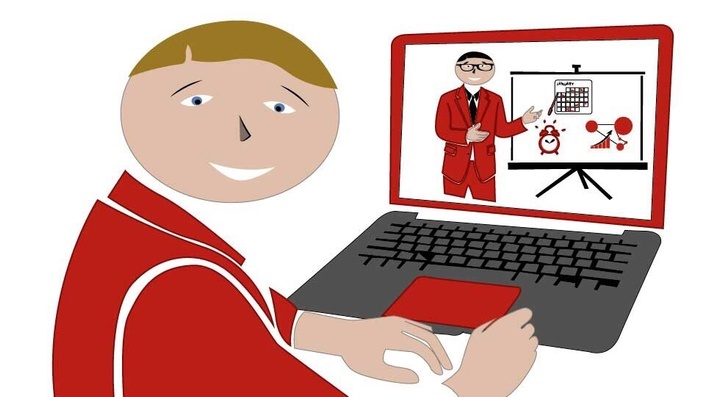 After schedule network of the project has been finalized during the develop schedule process of Project Time Management, you will have start and end dates of each activity from the beginning of the project until the end. Activities of the project will be completed in order depending on the relationship between them. 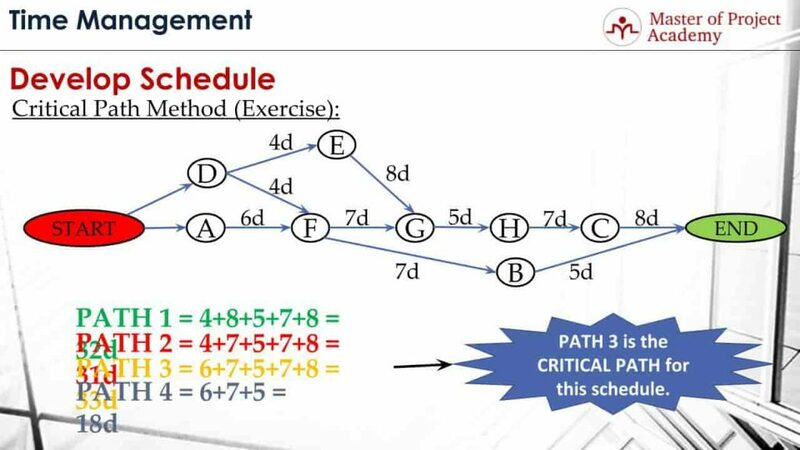 And critical path method aims to determine the longest path of activities from start of the project until the end. Because this will give us the project duration. 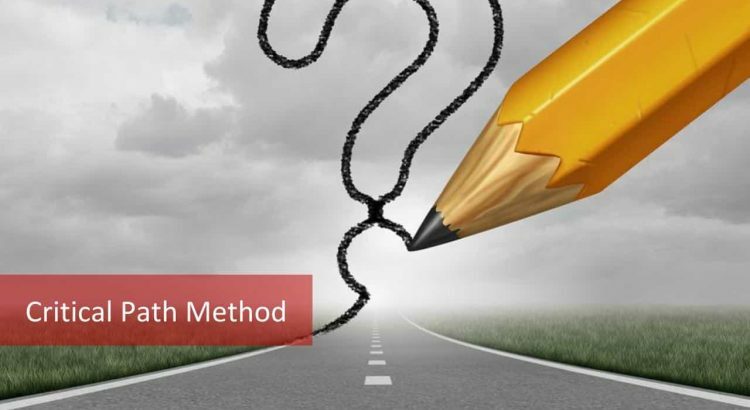 In this article, we are going to see how critical path is calculated and what are the important points about critical path method. It’s very important to learn this method well, so be sure to include it into your PMP study plan and assess your knowledge about the critical path with the help of online PMP exam simulators. What is the Definition of Critical Path and Near Critical Path? 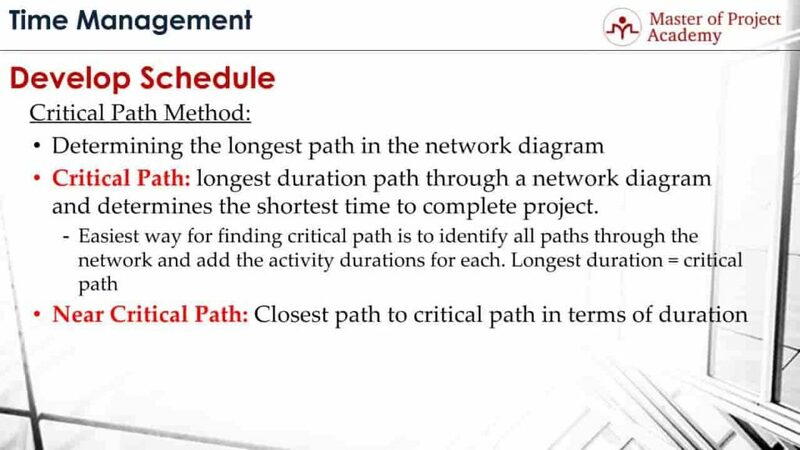 If you look into the Critical Path definition PMBOK pdf, it is “the longest duration path through a network diagram, it determines the shortest time to complete the project”. 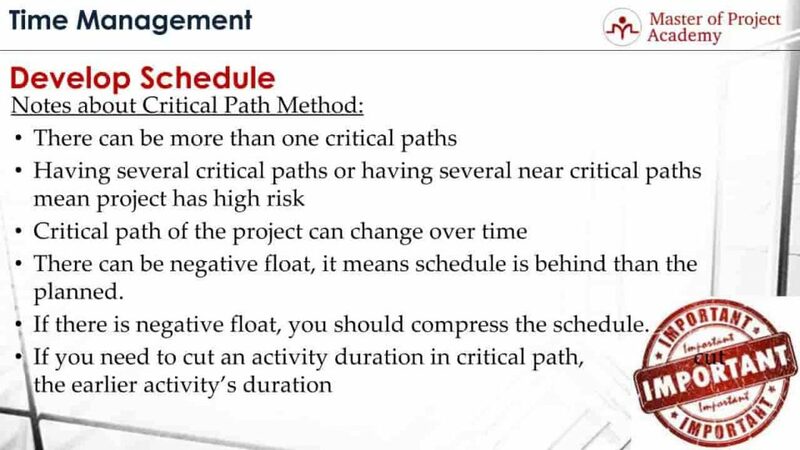 In other words, once you determined the critical path, you will have the project duration. Critical Path is determined by identifying all paths of activities from the beginning of the network diagram until the end. After all alternative paths of activities are identified, the longest path that goes from the beginning until the end will be critical path. The closest path to critical path in terms of duration is called as near critical path. 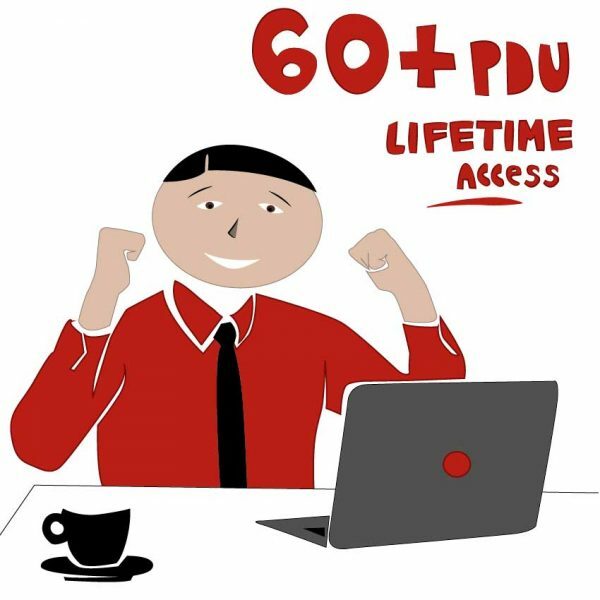 Let’s say that your project’s critical path is 18 months. If the nearest path that is close to 18 months in the network diagram is 17 months, then near critical path will be this one. It is better to describe Float here. The Float also called as Slack, is the amount of time that an activity can be delayed without causing project delays or causing delays in other activities. There are 3 types of float. let’s review them one-by-one. Total Float: Total Float is the amount of time an activity can be delayed without delaying the project end date or an intermediary milestone. Let’s consider that a project activity is not on the critical path. Since it is not on the critical path, delay on this activity can be compensated. But there is a limit here. If it is delayed too much, you will exceed the critical path duration and this will cause project delay. Float here helps you to see how long you can delay an activity, without affecting the project duration. 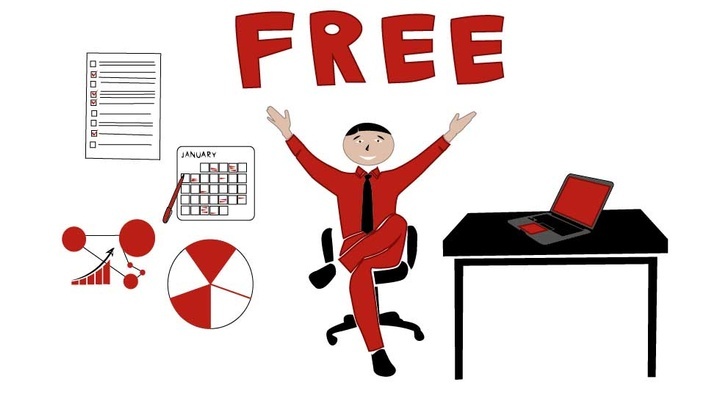 Free float: Free float is the amount of time an activity can be delayed without delaying the early start date. 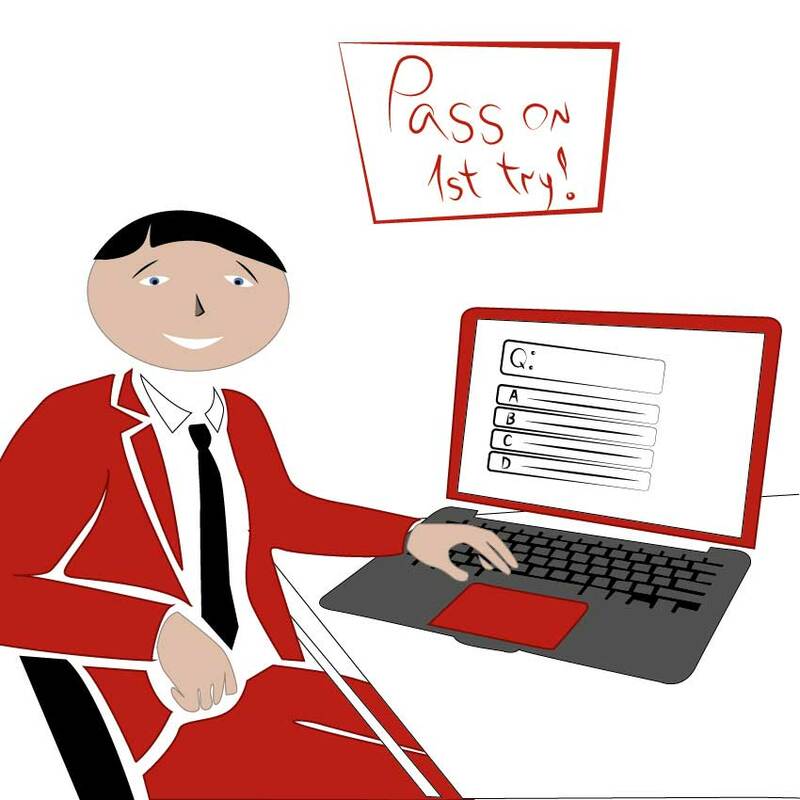 Early start date of an activity shows the earliest data that an activity can be started. Because, an activity will depend on other activities, constraints etc. Therefore, it will have an early start date. And free float is the amount of time that an activity can be delayed, without delaying the early start date. 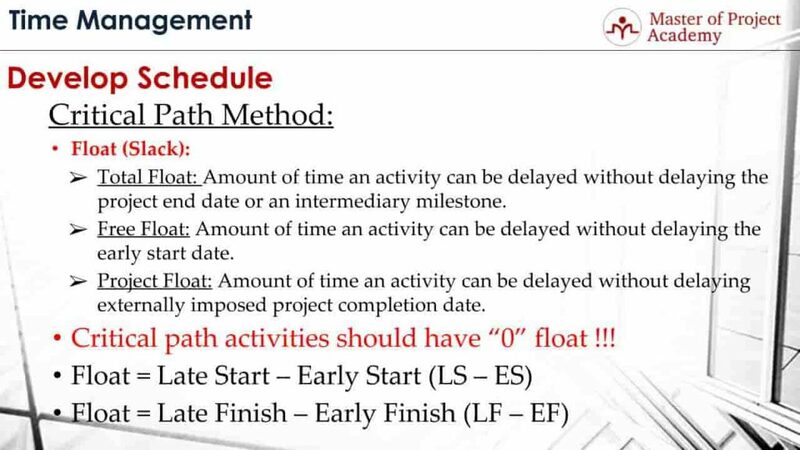 Project Float: This is the amount of time an activity can be delayed without delaying externally imposed project completion date. Note that Critical path activities should have zero floats. This is because the critical path activities show the longest path of the project to complete, and therefore any activity on the critical path will have zero floats. Any delay on a critical path activity will cause project delays respectively. How Does the Float of an Activity is Calculated? Float of an activity can be calculated in two ways. Either Early Start is subtracted from the late start, or early finish is subtracted from the late finish. How do we calculate the Early Start, Early Finish, Late Start and Late Finish of an activity? This figure gives us a way to do this calculation. 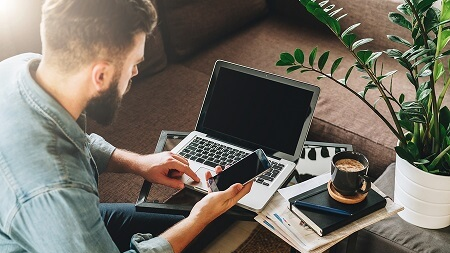 If you are calculating early start and early finish of an activity, you need to move from the start of the project until the end of the activity. 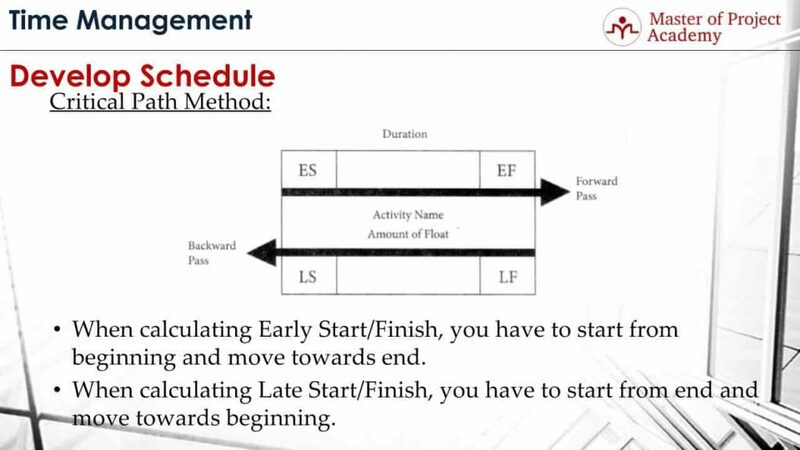 If you are calculating the late start and late finish of an activity, you need to move from the end of the project until the start of the activity. Critical Path Method is a very important topic. It is widely used in project management world and in real-world projects as well. Therefore, it is better to stress important notes about critical path method. There can be more than one critical paths in a project. If there are more than 1 critical paths which have the same duration, then, you need to focus on all of these critical paths to monitor the project duration. Having several critical paths or having several near critical paths mean the project has high risk. Because, instead of only one critical path, your project schedule depends on several critical paths. Respectively, your project schedule performance will be depending on activities on those several critical paths. Several critical project activities will bring higher risks respectively. The critical path of the project can change over time. Let’s consider that you determined the critical path of the project and let’s assume that the near critical path was 32 days and the critical path was 33 days. If an activity is completed 2 days earlier in the critical path during execution, your near critical path can be the new critical path of the project. 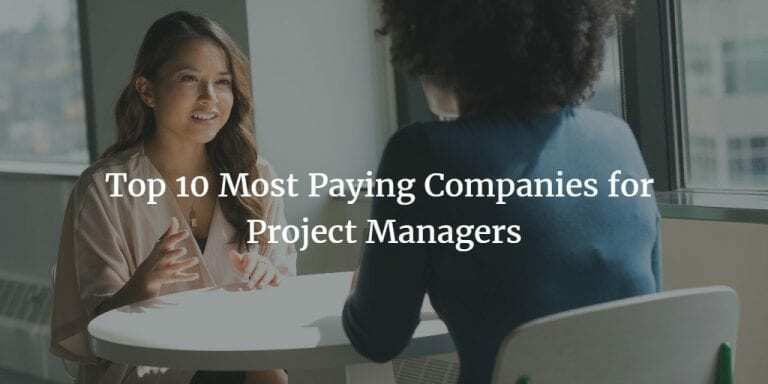 Therefore, actual results must be updated on the project plan frequently, and an up-to-date critical path must be monitored to reach project deadlines. There can be a negative float in a project. This means the schedule of the project is behind than the planned value. Normally, if everything is going as planned, float of an activity must be zero or positive. Only critical path activities will have zero floats. However, if the project is delaying, some activities might have negative floats because the previous project duration is no longer valid. If there is a negative float, you should compress the schedule. Negative float means the project is behind the schedule. 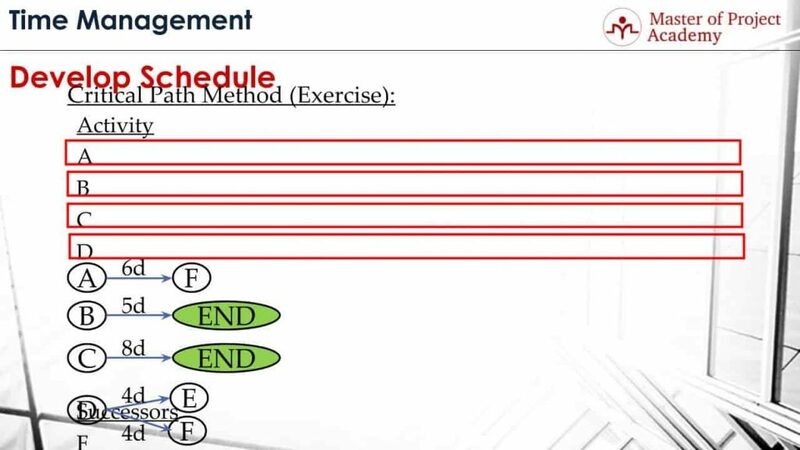 In order to meet the agreed deadline, you must complete the remaining activities in shorter time and this is achieved by schedule compression. If you need to cut an activity duration in the critical path, cut the earlier activity’s duration. Because, when you are getting close finishing the project, you will have less room to accommodate surprises or risks. But if you shorten the duration of an earlier activity, even if you experience any risk or surprise with that activity, since you will have more time, it will be better to deal with it. Let’s see a critical path method example with the solution. How to calculate critical path? In this critical path example, we’ll go through the activity list you see in the figure, define the relationship of activities, create the network schedule, determine the critical path, and calculate the floats of 2 activities. Activity A and its successor, Activity F. The duration is 6 days. This means activity A will be followed by activity F.
Activity B does not have any successor, and its duration is 5 days. Activity C has not any successor either, and its duration is 8 days. Activity D is followed by activity E and F, and its duration is 4 days. Activity E is followed by activity G, and its duration is 8 days. Activity F has two successors B and G, and its duration is 7 days. Activity G has one successor, which is activity H, and its duration is 5 days. 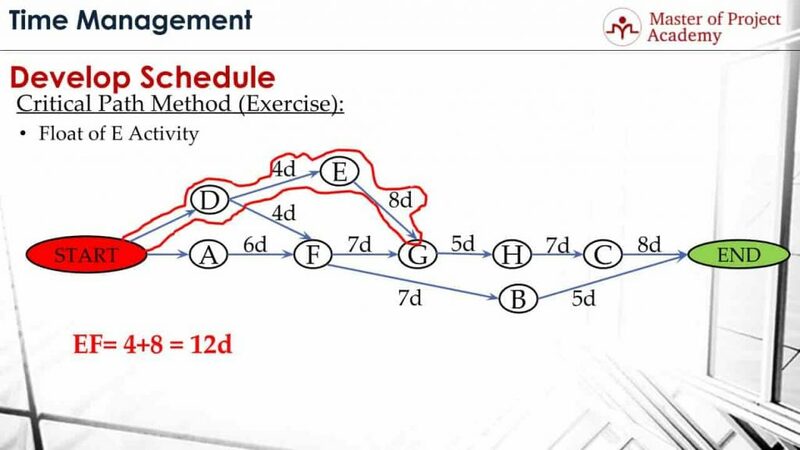 Activity H is followed by activity C, and it takes 7 days. Here in this exercise, we will calculate the critical path of the project, and the float of activities E and F.
In order to find the critical path, first, we will draw the network diagram. Then we will define each possible path in this network diagram from start of the project until the end, and then we will define the longest path in this network diagram, which will give us the critical path. And after finding the critical path, we will find the float of activities E and F, respectively. In order to draw the network diagram, first, we will define the relationships of each activity. 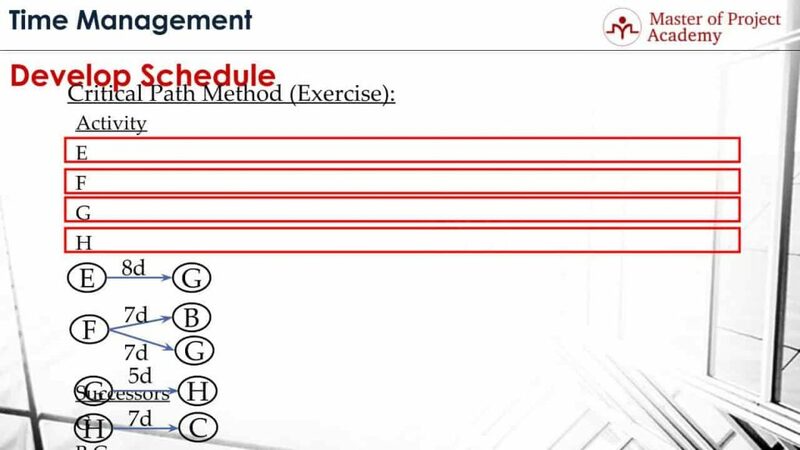 The first row says that activity A is followed by activity F, and its duration is 6 days. To draw this relationship, as you see A is followed by activity F, we define a finish to start relationship. And also we reflect the duration of activity on the F side of the arrow. Similarly, we have to define activity B’s relationship. Since it has not any successors, it must be one of the latest activities in the project and project should end after these activities. Similarly, activity C is also the last activity of the project and its duration is 8 days. Activity D is followed by two activities, activity E and F. And its duration is 4 days. Activity F has two successors B and G, and activity F’s duration is 7 days. Activity G is followed by activity H, and its duration is 5 days. Activity H has a successor activity C, and its duration is 7 days. We have completed defining the interrelationship of 8 activities. Next step is, connecting these relationships with each other to construct the overall network diagram of the project. And once it is done, you will reach this network diagram below. As you see, it includes all activities, duration of activities, and the relationship of activities from start of the project until the end. It also includes all possible activity paths from start until the end of the project to complete the project. We will go over these paths one-by-one now to identify critical path of the project. This is our first path. As you see the green sketch shows our first path from the beginning of the network diagram until the end. Activities of this Path 1 are D, E, G, H, and C, respectively. And now, if we calculate the duration of each activity on this green path, it gives the path duration as 32 days. The second path is this one below. And on this path 2, we have activities D, F, G, H, and C, respectively. And if we calculate the durations of the activities on this path, we will have 31 days as the duration of Path 2. The next path is this yellow path, and on this path, we have activity A, F, G, H, and C, respectively. When we aggregated the durations of each activity in this Path 3, we find the duration of Path 3 as 33 days. The other possible path from the beginning of the network diagram until the end is Path 4, which is the purple path, and on this path, we have three activities which are A, F and B respectively. When we sum up the activity durations in this purple path, we find the duration of Path 4 as 18 days. As you see here, over the four possible paths, from the beginning of the network diagram until the end, the longest path is Path 3. Therefore, Path 3 is the critical path of this network diagram. 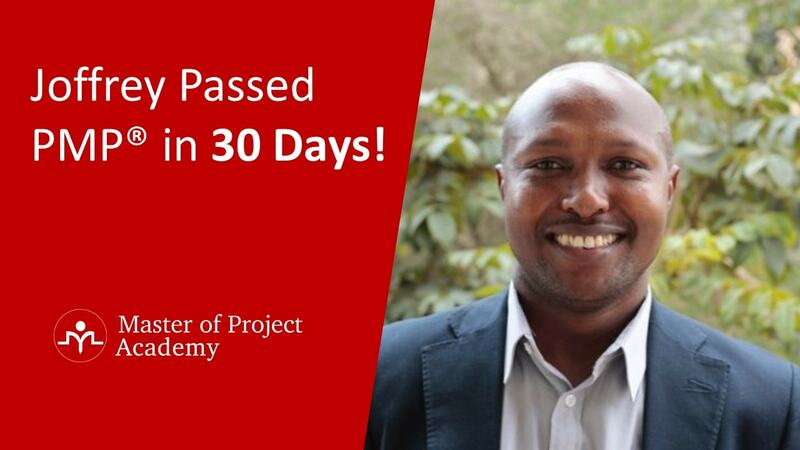 In other words, this project can be completed in 33 days. Since activities A, F, G, H, and C are on the critical path, any delay on these tasks will have a direct impact on the project duration. 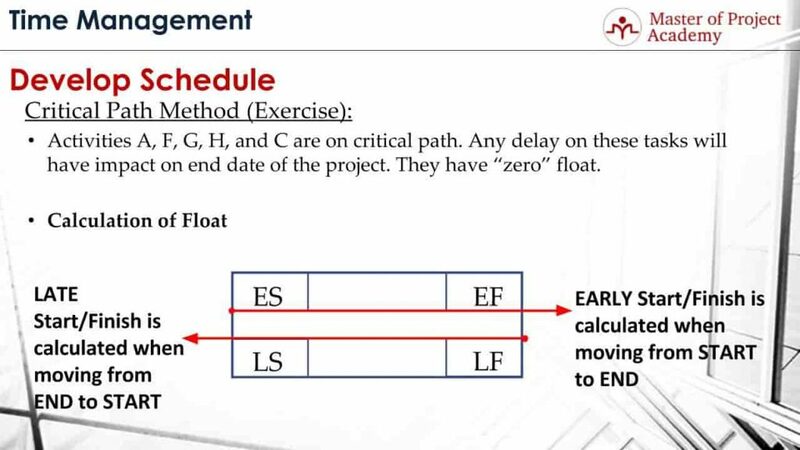 Therefore, these critical path tasks have zero floats. 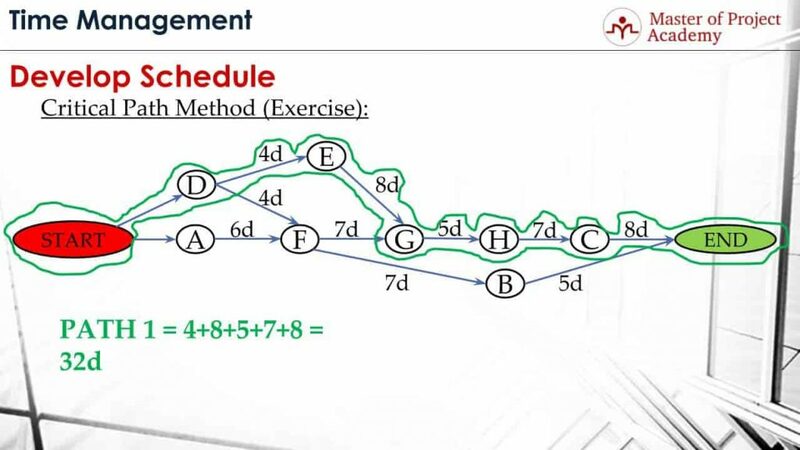 Now, we will calculate the float of activity E. And here, if you remind the calculation of float when we were calculating the early start and early finish values, we were moving from start point to the end point of a network diagram. 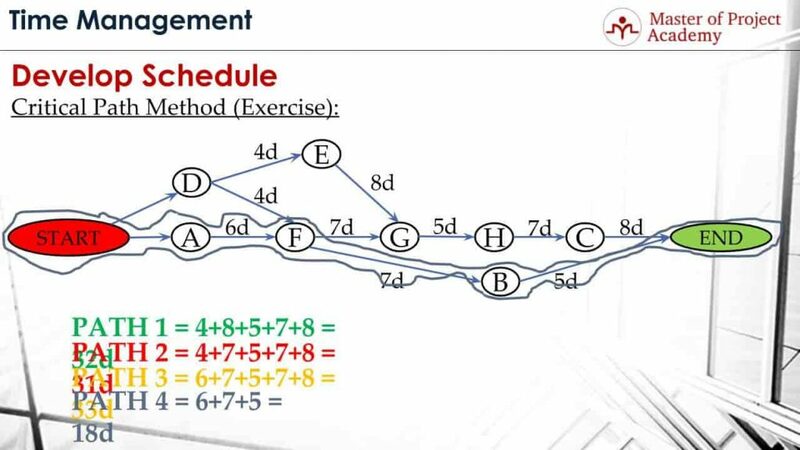 And when we were calculating the late start and late finish values, we were starting from the end point of the network diagram and moving towards the start point of the network diagram. Now we will calculate the float of activity E. We will use late finish and early finish values to calculate the float. And in order to calculate early finish, I will start from the beginning of network diagram and sum up the activity durations until the Activity E is completed. In order to finish Activity E, Activity D must be finished first, and then Activity E must be completed. So the earliest finish duration for Activity E is 12 days. And in order to calculate late finish, we will start from the endpoint of the network diagram and subtract the activity durations until the end of activity E.
In order to finish the project, activity G, H, and C must be finished after Activity E. When we subtract the duration of these activities from the project duration which is 33 days, we will find the late finish value of Activity E as 13 days. In other words, in order to complete the project on time, Activity E must have been finished 13 days before the project completion date. Now, we have a late finish and early finish values for Activity E. If we substitute these values in the formula, float of activity E will be found as 1 day. This means Activity E can be delayed only for 1 day without affecting the project duration. This is how you create a network diagram over an activity list, define the relationship of activities, determine the critical path and calculate the float in a project.